The CPMR has organised a series of key debates in recent weeks with its member regions to help develop initial ideas and priorities for its Reflection on the future of Future. Several meetings have been held where regions, experts and representatives of the EU institutions have come together to discuss the key issues impacting on regions and how we can demonstrate the central place for regions, islands and outermost regions in the future vision of the EU. 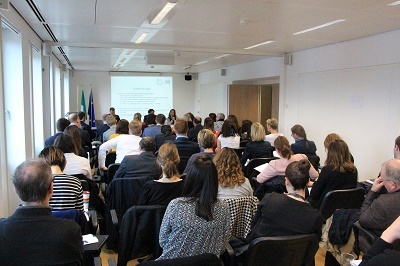 These included discussions on how Europe tackles ongoing social, economic and environmental challenges, as well as investing in competitiveness at the regional level, how to address growing populism and distrust of political institutions and structures, and relations between the EU and its neighbours, such as the impact of Brexit and the migrant/refugee crisis. Among these meetings was a briefing session on 17 March on the European Commission’s White Paper on the future of Europe. The briefing included a discussion with Margaritis Schinas, the Chief Spokesperson of the European Commission. On 4 May, the CPMR will hold a session focusing on the European Commission White Paper and the planned ‘reflection papers’ the Commission is due to publish in the coming months. The session will be with Ann Mettler, Head of the European Political Strategy Centre of the European Commission (it’s in-house think-tank). The meeting will also involve a session focusing on investment, territorial cohesion and competitiveness with Thomas Wobben, Director at the Committee of the Regions (who will focus on Cohesion Policy, Budget, impact of Brexit and future of Europe) and Richard Tuffs, Director of ERRIN (who will focus on co-operation between regions in research and innovation, including smart specialisation). Written essays/thought pieces to be posted on the CPMR Future of Europe Web Forum. These could be from officers or politicians, or could be from invited guests from your regions (experts/academics). Timeframe: April/May/June ideally in the first instance. To send to CPMR research, articles, reports of direct relevance to the theme/issue you are covering so that we can take into account in preparing the technical report on the future of Europe. Where relevant provide examples/case studies to illustrate the importance of action at EU level (including co-operation activities) within the theme/issue you cover. Please let us know over the coming days if you would like to lead on one or more themes/issues. We would also request that you send us details, where possible, of academics and other experts with a strong background in EU affairs and interest in the future of Europe. We have received a couple of suggestions to date and would like to widen the network as far as possible. The details we would ideally need for follow up would be: name of academic; job title/area of expertise; name of university/institution; contact telephone/e-mail.